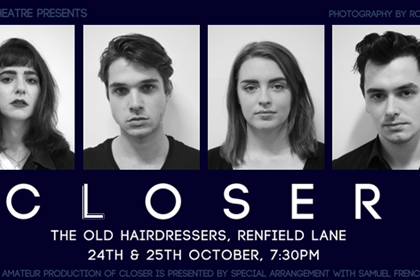 Closer by Patrick Marber follows the lives and relationships of four people. They meet, fall in love and break up in this episodic piece of human emotion. Marber’s play depicts the many facets of love and relationship: varying between hilarious and tragic, affectionate and frustrating, it never glosses over the ugly parts, the guilt and bitterness. It is a drama with many comical moments, sometimes blending into the ridiculous. The story was adapted into a movie in the early 2000s starring Natalie Portman, Julia Roberts, Jude Law and Clive Owen. Now, the new Crash Course Theatre, founded by four stage-loving students, takes on this nuanced piece – and it works very well. Contrary to classical theatres with a stage on one side and the audience on the other, here the actors play surrounded by the audience. This feels more intimate as you are closer (I see what you did there) to the action. Just like real life, you never see the entire picture and never the same as others do, which corresponds nicely with the themes and linguistic realism of the play. The quick changes in dialogue from one couple to the other and the complimentary use of image and video projection complete a well thought-out atmosphere. However, the closeness could have been taken one step further by further incorporating the audience. Nonetheless, I found it was a captivating way to experience theatre. The actors all showed a wide range of emotion and an ability to capture the nuanced atmosphere of the story. They delivered their lines in a direct and realistic manner, not at all staged. Even though the narrative demands quick changes of tone, the cast masters these fluctuations almost effortlessly. Only some of the aggressive outbursts at times lack credibility. Still, it is exciting to see such a shared level of talent in all of the four actors. The audience is taken on an emotional rollercoaster ride full of witty banter, laughter and tears. All these details make the show not only entertaining to watch, but leave a lasting impression. I am intrigued to see what this ensemble will show us in the future!